What is Biophilia, and Why Should You Care? According to the U.S. Department of Labor, more than 90 percent of a company’s operating costs are tied to human resources. And because employee productivity drives profits, workplace design remains an important factor that can either enhance or erode the bottom line. Biophilia is one element of design that increasingly is coming into focus; it leverages nature’s healing effects on our bodies and minds to boost workplace productivity and employee well-being. According to Terrapin Bright Green Research, the average company could save an estimated $3,000 per employee annually in office costs simply by reducing absenteeism and raising productivity. Yet both absenteeism and low productivity, where employees clock in for work but are mentally removed from the workplace, are negative factors that have been attributed directly to offices lacking visual access to nature. This statistic shows just how much a poorly designed building can cost a business. According to the US Census Bureau, American workers spend more than 43 hours per week in the office. Therefore, offices that connect people to views of nature and incorporate other biophilic elements can reduce stress and foster a more productive workforce. Biophilic engagement occurs automatically when we have a pleasant experience in nature, whether it’s walking in the forest or gazing up at the clear blue sky; this same response can be triggered by a realistic simulation of nature. Biophilic illusions such as the virtual sky compositions can trigger our fundamental “genetic” memories of nature, thereby lending the simulation a level of realism that our physiology recognizes as genuine. This effect is particularly effective when the observer find himself in enclosed interiors for a prolonged period like the average workday. James Mauch of Tenmast Software is CEO one such environment. 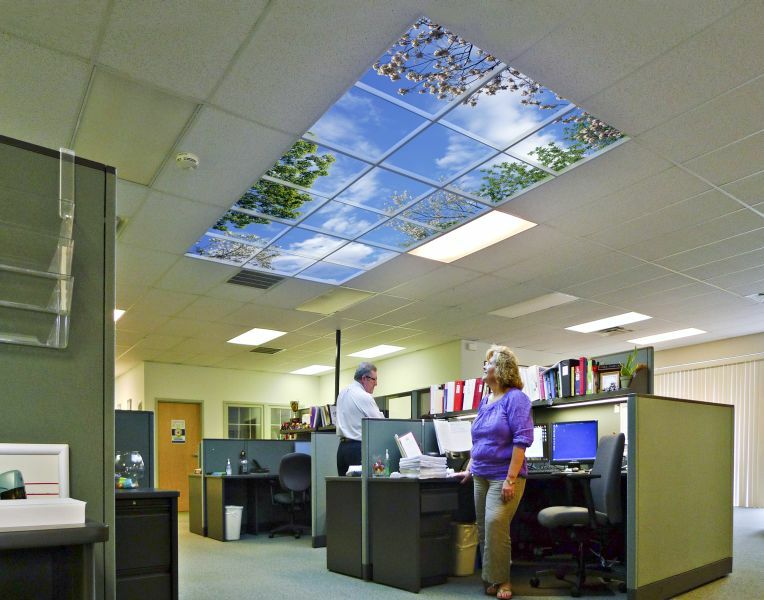 He decided that, in an office without much direct-light access, he would experiment with a virtual sky composition to improve employee well-being. The outcome, according to Mauch, is that his employees report being happier at work –- even those who don’t sit directly under the skylight but have a view of it from the outskirts. also, the link in the article is broken. interesting concept, but i would have liked to see the article go into a little more detail. how is this simulation achieved? do they used lcd panels? some other technology? how much does it cost? etc.